Over the past year, I have written a variety of articles about peace studies for a variety of publications and groups, from STATIC to the United Campus Christian Ministry (UCCM). 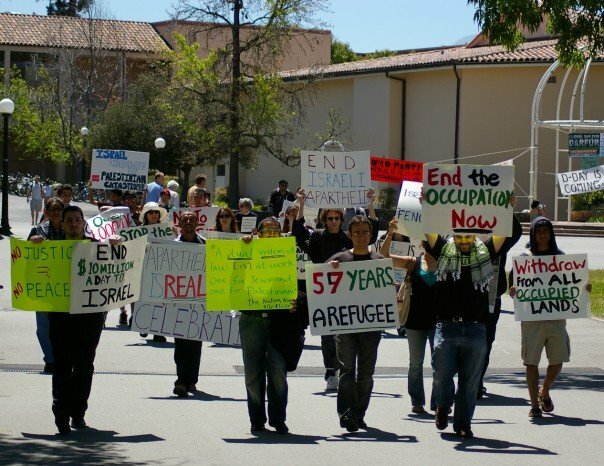 In my last article, I laid out the many courses that related to peace and justice at Stanford. But this is not enough. Not nearly enough. Leenda Gonzalez, a Stanford student in the early 1980s involved in the effort to generate peace studies courses back then, said in 1985 that ““There is a notion running around the hallowed halls of Stanford that could kill you. This notion suggests that peace is extracurricular.” Today, the hallowed halls are still here, and peace is largely still extracurricular. It happens every year in the middle of May: an extravagant celebration of Israel’s “birthday” in the middle of White Plaza, with a big tent, inflated balloons, a camel (real or inflated), falafel and other indications of Middle Eastern culture. And every year in the middle of May, right across from that celebration, a group of activists shrouded in black, stands off to the side with signs protesting this joyful occasion. Last year I was one of those activists shrouded in black, but this year, I paused and asked myself: do I really want to put myself in that position again? My peers casted their glances upon me as they walked by — some bewildered, some surreptitious, some with indiscreet looks of hostility towards me. And, in case I tried to cast aside the feelings of discomfort, occasionally someone would take a picture of me and share it, rendering my shame and persona non grata status permanent. But the most difficult part was seeing the faces of those passing by who knew meand did not approve of what I was doing. I could not endure the expressions of my Jewish friends as we experienced awkward moments of silent confrontation; do I wave? Pretend I don’t see them? Shamefully look away?